A continuation of a series, until the lewd #metroseminarian poster is removed. 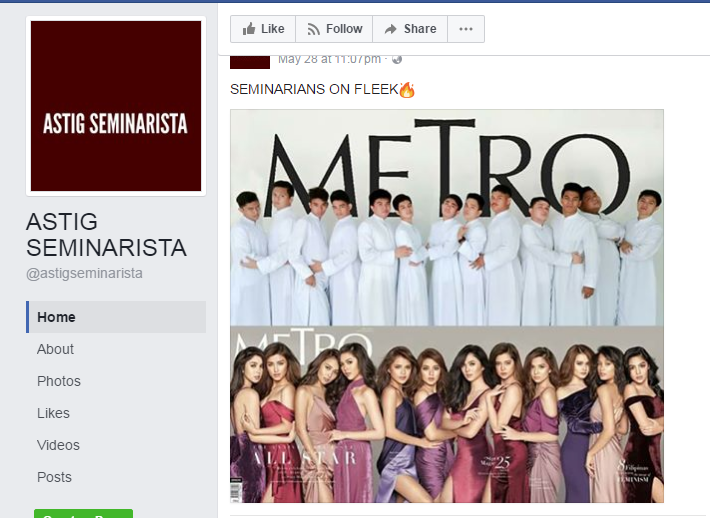 It has been about a week since I published my displeasure with the controversial metro seminarian photo. Much has happened since. People were throwing ad hominems from both sides — friends of the seminarians, friends of the laity, friends of the church and even from those who are trying to be objective and neutral about the issue and are not clear about whose side they’re on. One thing for sure, we all knew and felt we had a bit of truth in what each of us had to say. However, the need to fight for the truth in the spirit of justice enkindles the fire of urgency. Such enflamed and hungry need for results could very much blind one to reasonable action, especially when the struggle for prudence is disrupted by uncalled for taunts and inappropriate conduct from people who identify themselves as friends of the seminarians in focus. As my blog reached more than 5,000 reads (a number I had never imagined I could achieve since my first foray into blogging a couple of years ago), it is no surprise that I would find myself the subject of some bashing here and there. I take these as mere affirmations that the pen is truly mightier than the sword. What frustrated me though is the complete and utter disregard for the moral correction being applied by those who deemed the photo inappropriate, and the humility to concede and admit where the miscalculation fell short. The retaliation from ‘friends of the seminary’ who had established with us on several Facebook threads that they were former seminarians of St. Vincent’s, had the most unbelievable, and unfitting rebuttals, clearly borderline ‘tambay sa kanto’ (bystanders in the ghetto) slang. It is unfortunate enough that the seminary had lost some potential priests along the way and that the remaining members of the seminary showed no indication of realizing the offense of such a post is truly tragic. Many who shared my sentiments were even more frustrated that we have not heard from anyone in authority at St. Vincent Seminary. After much discussion with a few people who were willing to take concrete action, as opposed to just cheering instructions from the sidelines, I released the said petition and in less than 10 minutes, 9 people had immediately signed it. Surprisingly, two people who were adamant in taking the same stand spoke to me and made me realize that taking the longer route might garner more appropriate and agreeable results, without causing a greater fiasco than it already has. I did not push through with the petition, but I did press on with the cause. Calls were made to the Bishop’s office to follow up on the matter because apparently, they were advised that the issue is now resolved. I do not know how these boys managed to convince their superiors that the first poster was already removed, when clearly in a much earlier post, another copy of the photo remained. I have already said my piece on what makes this photo appalling. And while I understand that there is a growing need to attract postulants to the religious order, borrowing from the fame of such photos while overlooking the sanctity of the religious garb is totally out of place. The attempts at modernizing the call to the Church with such malicious innuendos — and the lack of proper resolution to address it — gives the laity reason enough to be saddened and to possibly lose hope that the battle to preserve the sanctity of the Church is a lost one among this generation. I will raise this as an added flag, and I am bringing this page to the attention of St. Vincent’s Seminary in the hopes that they will establish whether Boom Seminarista was created and is being maintained by them or not. I would expect them to deny it. But if they are aware that this secondary post exists, then they should be aware that it continues to taint their good name, and that hopefully, they may see fit to issue a call for action, and for this page to be removed.